Personalized House Number Sign with Lighthouse - - decorative arch plaque custom made with your address numbers and choice of color. Wall mount or add optional lawn stakes for ground placement. Made in USA. Lighthouse on its own tiny island nestles inside the arch top. Holds up to five 4" or seventeen 1.25" characters. 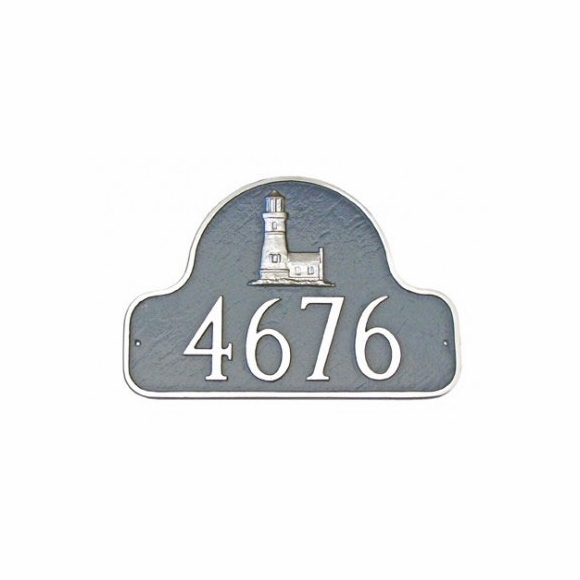 Arch shape aluminum sign features a charming lighthouse above the one-line house number. Comes in 26 different color combinations. Made in the USA.